It is a longest island on the Adriatic. Its widest and most rugged part is the western part, where Sveti Nikola (628 m), the highest peak of the island,rises above the southern coast. The entire coast is steep and lined with numerous bays. Almost everywhere on the island, the forest reaches all the way to the coast. The northern coast is much more rugged than the southern. The largest bay is the Starigrad Bay. The area between the settlements of Stari Grad and Jelsa is fertile. There are no surface streams, and the only larger freshwater spring is located near Jelsa, from where a water supply system leads to the town of Hvar. The island has a very mild Mediterranean climate. The main economic activities are tourism, agriculture, wine growing, olive, rosemary and lavender growing, and fishing as a supplementary activity. There are fish canneries in Hvar, Sucuraj and Vrboska. 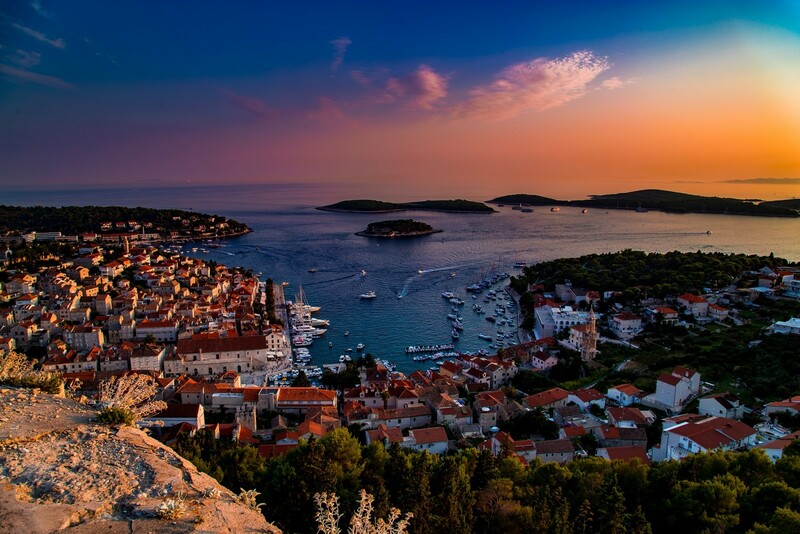 The most prominent settlements in terms of tourism are Hvar and Jelsa. All larger settlements are linked by roads, and ferry lines connect the island with the mainland, in front of the southwestern coast lies the Pakleni otoci archipelago, and in front of the central part of the southern coast lies the island of Scedro. The island has been inhabited since prehistoric times. Like the islands of Korcula and Vis, Hvar was settled by the Greeks, but only Hvar was the site of an Ionian settlement (Pharos, the present Stari Grad). Traces of that period include partly preserved walls, graves with earthenware, and numerous inscriptions, after the Roman era, Hvar and the entire Dalmatia came under byzantine rule. In the 7th century, it was occupied by the Neretvans (Neretljani). Between the 11th century and 1918, it was ruled by Croatian and Croatian-Hungarian kings, the Bosnian King Tvrdko, the Split herzeg (duke), Dubrovnik, Venice, France and Austria. In the 16th and 17th centuries it was an important center of Croatian literature. Strong winds blow across all areas of the sea surrounding the land, so even the normally moderate waves caused by the maestral are large. The bays on the northern coast are exposed to the bora, while the southern ones are exposed to the jugo. 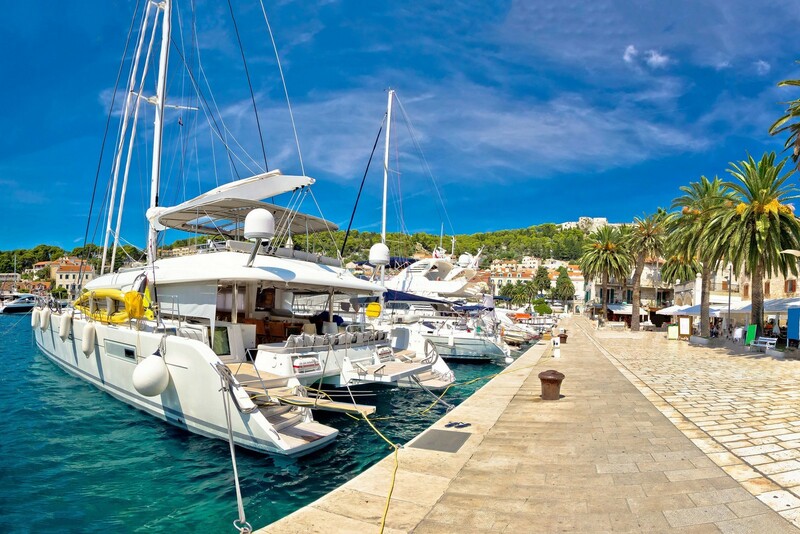 HVAR TOWN - A town with a port on a picturesque bay on the southwestern coast of the island. 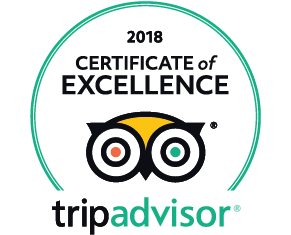 The largest settlement and tourist center on the island is also one of the most popular tourist destinations in Dalmatia. It has long been known for having on average 2715 hours of sunshine a year and a perfectly azure sea. Through the centuries it has developed in such a way that the town as a whole is now a monument. Its magnificent square with the cathedral is one of the most beautiful in Dalmatia. Tourism began to develop in 1903, when the first hotel was built. During the winter season, the hotels offer their guests special discounts if fog or snow should appear, or if the temperature should drop below zero. The ferry serving the Split-Hvar-Vela Luka-Uble line lands in the town of Hvar, but it does not load or unload cars, only passengers. Hvar experienced its heyday in the Late Middle Ages. In the 13th century it was the seat of a diocese. In the 15ft century, the old town core was surrounded by a wall, of which only the western town gate from 1454 remains. The Spanjol Fortress was built in 1557 on the site of the town castle on a hill. Around 1810, the French built the Napoleon Fortress (now an astronomical observatory and a seismographic station) on the Sveti Nikola hill, and the Baterija Fortress near the Franciscan monastery on a cape. The Arsenal, the largest secular architectural monument in Croatia, was built between 1579 and 1611. The Hvar galley was kept there. The story which was added in 1612 houses one of the oldest theater halls in Europe. Today the Arsenal houses a gallery of contemporary art. In the town center stand the Late Renaissance Cathedral of sv. Stjepan (St. Stephen) from the 16th and 17th centuries and the Renaissance bishop's palace with a museum. The town fountain from 1520 stands on the square in front of the cathedral. A Franciscan monastery and church from 1471 stand in the southeastern part of town. The church contains rich furnishings and houses a museum and an art collection. The former Dominican monastery with the Church of sv. Marko (St. Mark) from the 14th century houses an archaeological collection. Other attractions include a Renaissance clock tower from the 16th century with a bell from 1562, and the town loggia from 1479 in the town itself, and the Renaissance summer mansion of the playwright Hanibal Lucic beyond the town wall. The port is exposed to southerly and southwesterly winds, which cause waves even at moderate force and can damage boats. 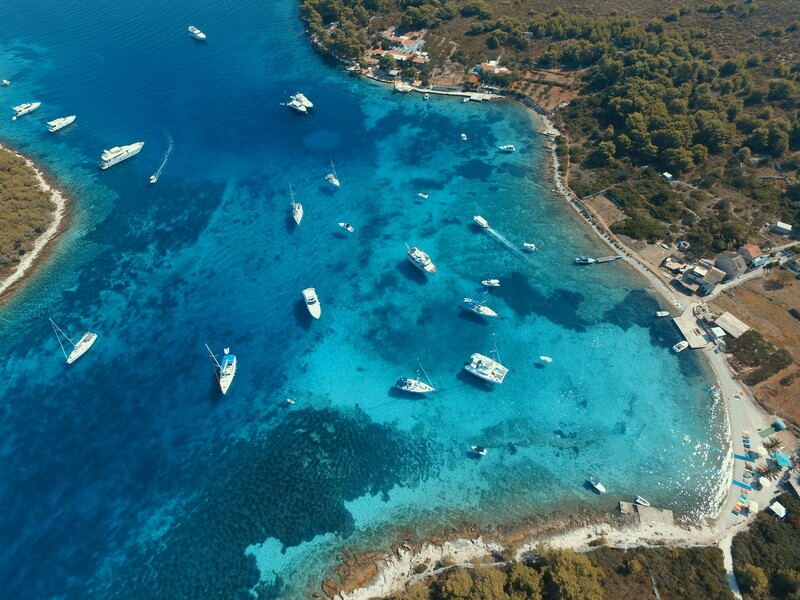 Boats can berth in the specifically designated area in the long harbor at a depth of 4 m, or raft up to yachts if there happens to be any space. Due to heavy traffic caused by passenger and tourist ships, boats frequently have to be moved. 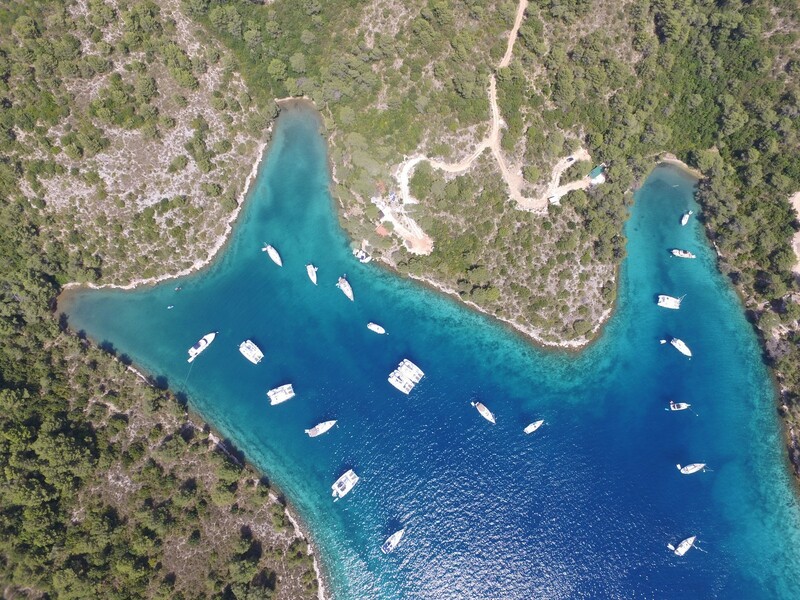 There is a fuel dock in Krizna luka south of the town of Hvar, but the depth at the landing is only 1.5 m. There are a number of reasons why it is not advisable to berth or anchor in the port. JELSA - A well-known tourist town with a port on the northern coast of the island, surrounded by pine forests. Centered around a picturesque square that lies on the coast, it is one of the most vibrant settlements on the island. 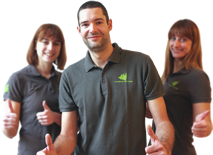 Its economy is based on agriculture, wine and olive growing, fishing, shipbuilding, navigation and tourism. The surrounding beaches are sandy. The Soline beach is located on the Glavica Peninsula, and the islet of Zecevo has attracted naturists since the 1960s. Jelsa was mentioned in the beginning of the 15th century as the port of the village of Pitve. At the end of the 14th and the beginning of the 15th century it was settled by Bosnian refugees, and in the 17th century by refugees from the Makarska Riviera. The marshland on the coast was drained in the 19th century and a new center began to develop. The 16th century Parish Church of sv. Fabijan and Sebastijan (Sts. Fabian and Sebastian) was transformed into a fortress during the Turkish raids, which is still apparent in its form. The 15th century Church of sv. Ivan (St. John) has a trapezoidal ground plan. The Church with a cemetery on Gradina was built in the 15th century. A well-preserved Greek observatory made of large stone blocks stands on a hill called Tor to the south. The port is protected by two breakwaters with a depth of up to 3 m. Boats can berth in a harbor or at a pier with a depth of 3 m. It is unfortunate that more berths are not available. The port is partly exposed to northeasterly winds. MILNA - A small tourist town with several good inns on a wide bay. It began to develop after 1956, when the inhabitants of the abandoned settlement of Malo Grablje began to build their homes here. The bay provides good anchorage, protected from all winds except the southerly. Despite the piers, there is no space for berthing during the season. There are buoys from good restaurants in the bay. SMARSKA - One of the most beautiful bays on the southeastern coast of the island. The bay is lined with a few houses which are still inhabited. There is a small pier with a depth of up to 2.5 m in the bay. Anchorage can be found in front of the pier at a depth of around 7 m. It is exposed to southerly winds. When the jugo blows strong, the anchorage must be abandoned. STARIGRAD - A settlement with a port on the Stari Grad Bay which cuts deep into the northwestern coast of Hvar. The main economic activities are agriculture, wine growing, olive groves, fruit growing, grape processing and fishing, as well as tourism which is equally important. Modern tourist complexes were built along the old town core. There are picturesque beaches in numerous bays. 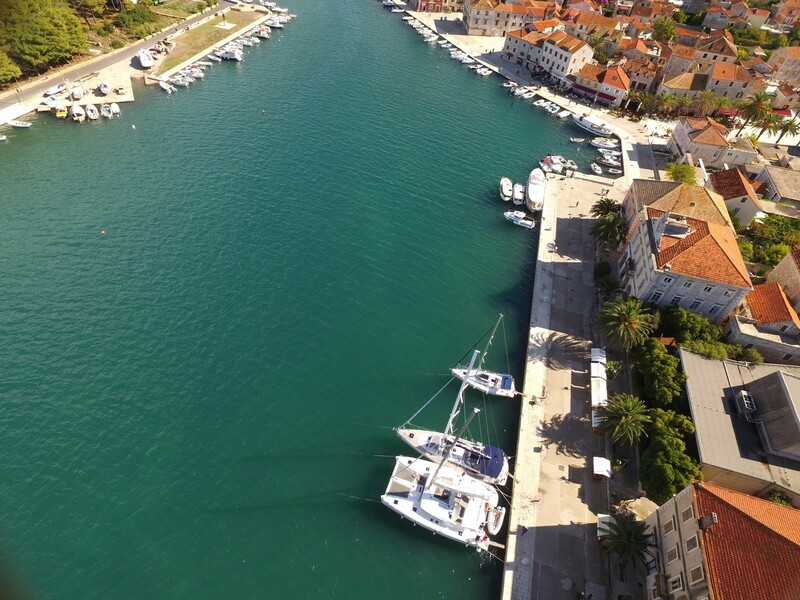 Starigrad is connected with Split by a regular ferry line, but the ferry landing also serves the international Rijeka-Zadar-Split-Stari Grad-Korcula-Sobra-Dubrovnik-Bari ferry line. 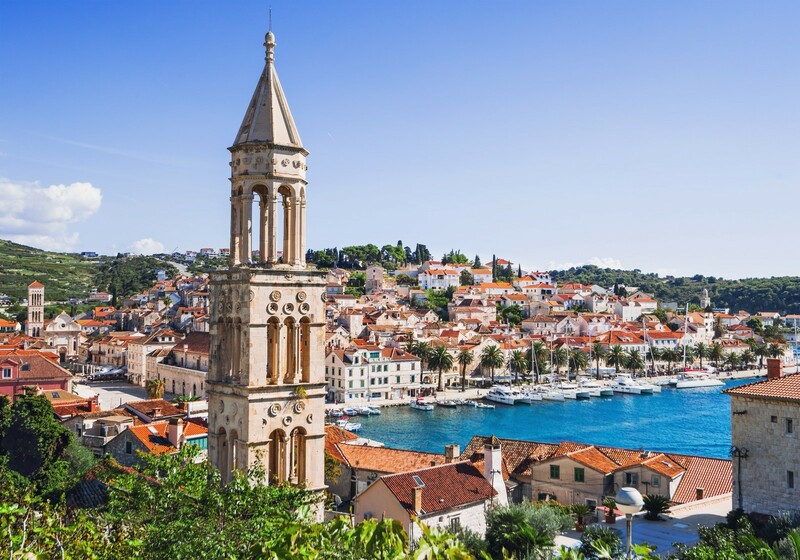 The first settlement was built in the 4th century B.C., when the ancient Greeks established the Pharos colony, the oldest urban center in Croatia. In 1205 the settlement began to be mentioned under the name of Civitas Vetus (Old Town, i.e. Stari Grad), because the new town of Hvar began to be built in that period. Important historical monuments include the remains of a Roman villa, the Early Christian Church of sv. Ivan (St. John) from the 12th century, the Tvrdalj, the summer mansion of the poet Petar Hektorovic from 1520, the Church of sv. Rok (St. Roch) from 1569, the Baroque Parish Church of sv. Stjepan (St. Stephen) from 1605, a Dominican monastery from 1482 (restored in 1682), the Baroque Skor Square and several Baroque houses. In the 19th century, Stari Grad was one of the most important maritime center in Dalmatia. The extensive Stari Grad Bay is exposed to westerly winds. 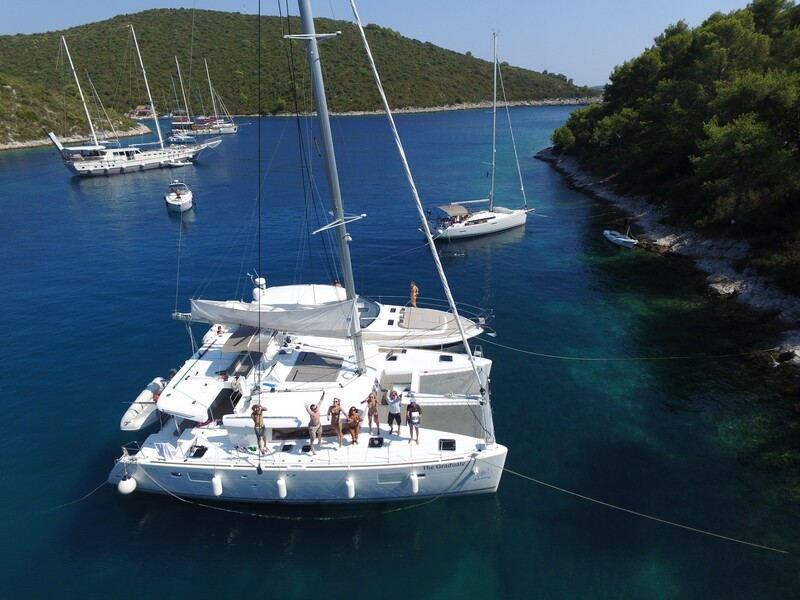 Boats can berth in a harbor in the southeastern part with a depth of up to 3 m, or tie up to mooring lines with electricity and water hook-ups. Anchoring behind the small breakwater is practically impossible because the bottom of the sea is covered by a stone slab. Facilities include a launch ramp and a small shipyard with repair shops. 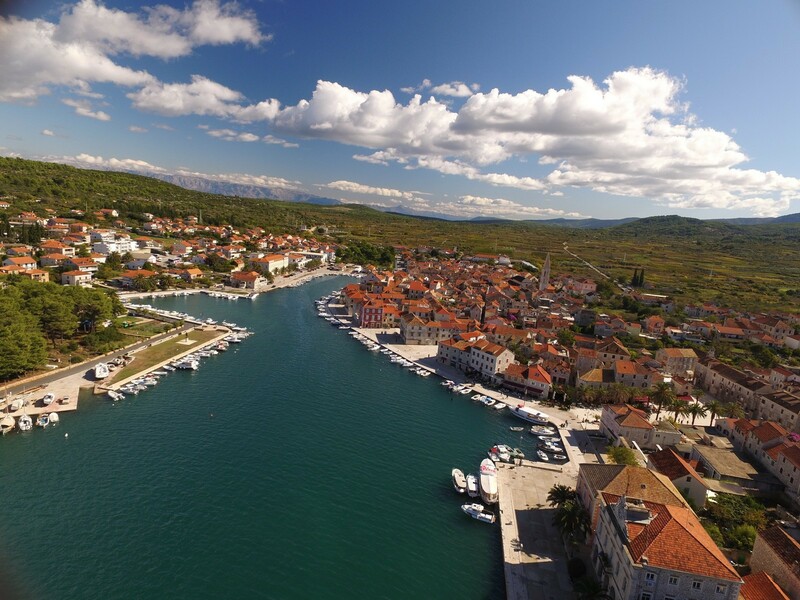 Starigrad is one of the most protected ports in the Central Dalmatia, especially from southern winds. SUCURAJ - A settlement with a small harbor on the easternmost part of the island of Hvar. A ferry line connects it with Drvenik, a town on the Adriatic highway three nautical miles away. Part of the Augustinian monastery from 1573 has been preserved. In 1631 the Venetians built a defense fortification. There is a beautiful square in front of the Baroque church from 1664. The port is protected by a knee-shaped breakwater. Berths are available at the breakwater with a depth of 2.5 m, or in a harbor in the northern part of the port with a depth of up to 2.5 m. Boats can anchor around 300 m from the port, except when the jugo blows. 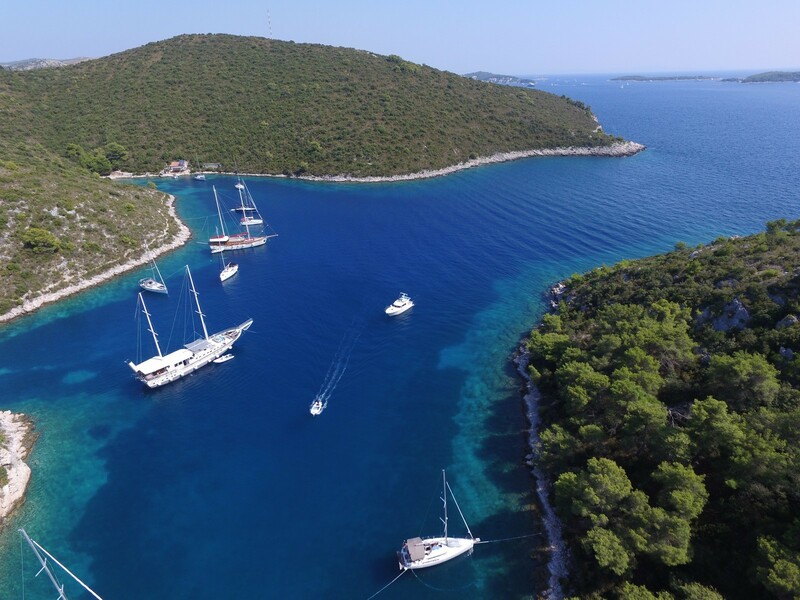 SVETA NEDJELJA - A settlement on the steep southern slope of the island, southeast of Hvar. The surrounding area is covered with vineyards which produce the finest Hvar wines, including the well-known Plavac. There is a private campsite in the settlement. In Sveta Nedjelja stand the remains of an Augustinian monastery which was built in the 15th century and disbanded in 1787. The small concrete harbor with depths between 8 and 11 m is meant for larger boats and is exposed to the waves caused by the maestral. VRBOSKA - A settlement on the narrow Luka Vrboska Bay that cuts deep into the northern coast of the island of Hvar. 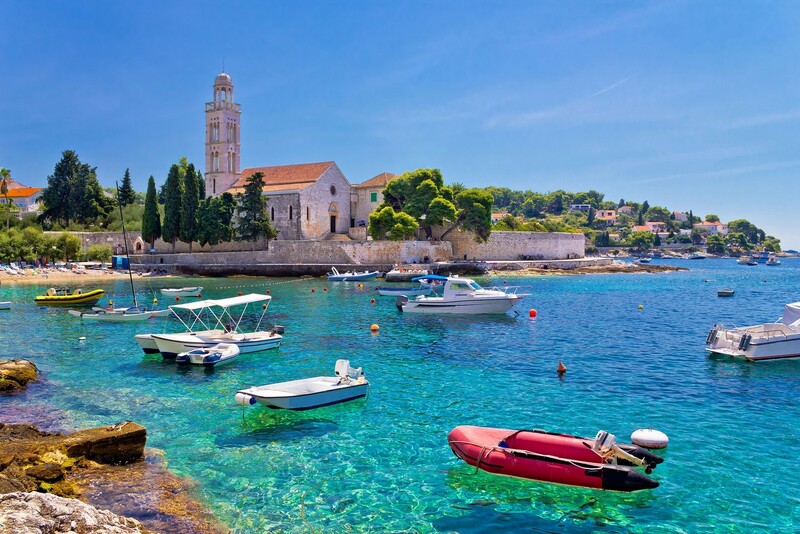 It is one of Hvar's main fishing centers and features a fishing museum. The bay is surrounded by a pine forest. The settlement was established in the 15th century by the inhabitants of the settlement of Vrbanj in the interior. In the middle of the settlement stands the fortified Church of sv. Marija (St. Mary) from 1465, a rare monument of this kind in Dalmatia. The Parish Church of sv. Lovrinac (St. Lawrence) was built in the 16th century. The main altar contains a polyptych painted by Paolo Veronese between 1571 and 1579. To the east stands the Church of sv. Petar (St. Peter) from 1469. The narrow and deep bay is well protected. 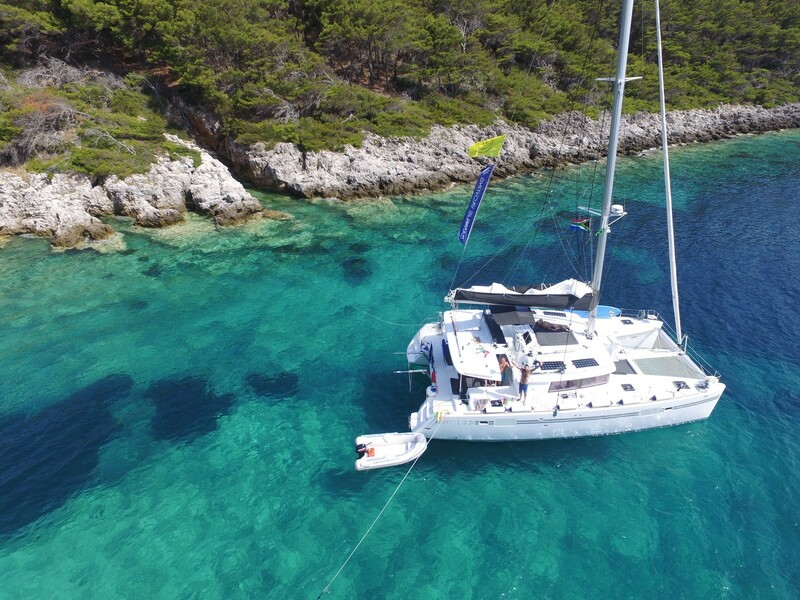 Berths are available in a 2-m-deep harbor or in the marina which is exposed to southern wind does not stop blowing, the sea level can rise by up to 2 m. ACI Vrboska Marina (021) 774 018 - There are 85 berths, 30 spaces for dry storage, a repair shop and a 5-ton lift. The depth of the sea is 5 m.
ZAVALA - A settlement with a harbor on the southern coast of the island, it is connected with Jelsa by a road which runs through a more than kilometer long and very narrow tunnel, in which the cars an only pass at a few weddings. The old part of the settlement es away from the coast, while the new part lies by the sea and as a harbor and a beach.